Sixteen-year-old Ernest Medina he lied about his age so that he could join the National Guard. He started as a radio operator but was too small to carry the 65-pound pack, so he became a cook. He attended meetings and summer programs, and marched with the color guard at the football games and in parades. Within a year of graduating from high school, he had risen to the rank of E6, one notch from the highest possible for an enlisted man. After high school graduation, Medina worked in a variety of jobs. He worked briefly in the forestry service, then as a soda jerk, then for a lumber company, then in a hardware store, then as cashier in a drugstore. In 1956, Medina followed his lifetime dream of joining the army, starting only a notch above a recruit. From basic camp he was sent to Germany, where he remained until his twenty-first birthday, by which time he had become a staff sergeant. After meeting and falling in love with a tall, blond German woman named Baerbel while touring Germany in a Mercedes, Medina turned down an offer to take an exam to go to Westpoint. Instead he married Baerbel. Seven years later he went to OCS where he graduated with honors and as battalion commander of his cadet class. Medina taught at OCS for two years, and was then sent to Hawaii. 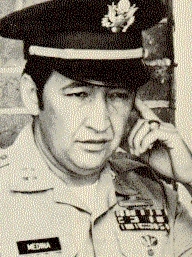 In December, 1966, Medina was made commanding officer of Charlie Company. When first questioned about My Lai, Medina was in the midst of a nine-month career officers’ training course which would have enabled him to be promoted to the rank of major. He had been marked for advancement since he left Charlie Company. Although acquitted in the court-martial growing out of his role in the My Lai incident, Medina's prospective promotion in the army was derailed. Medina left the army to move to Menomee, Michigan, where he worked in a helicopter manufacturing company owned by the defense lawyer in his court-martial, F. Lee Bailey.